Destarté® is a Mescalero Apache word that can loosely be translated into English as "the first light of dawn over the desert and mountains." 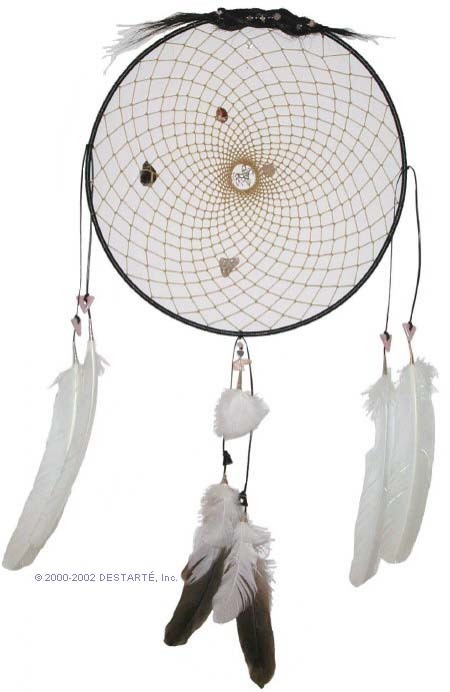 We have always considered this appropriate as that is precisely when you will most appreciate the beauty and benefits of one of our hand-made Dreamcatchers. Due to the nature of natural stones, colors and sizes of beads may vary. Any questions please feel free to call us at 703-652-8421. Guarantee - In the unlikely circumstance that you are not completely satisfied with your purchase, we will gladly refund the purchase price, less shipping charges, for any standard dreamcatcher or jewelry. 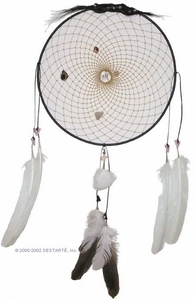 Due to the fact that customized dreamcatchers and jewelry require a great deal of time and effort and are not suited to other customers, no refunds may be granted for those, however, we will do our best to make sure you are happy with your customized merchandise. Each custom piece is "mocked up" and an image is e-mailed to the customer for their approval prior to final creation. Shipping - Please note that since each Custom dreamcatcher or custom item of jewelry is individually made to order, it may take up to 2 weeks for it to be completed and delivered to you. For rush orders please and we will do our best to accommodate you. All items shipped within the US are shipped via Priority Mail insured from the U.S. Postal Service unless you to arrange an alternate method of shipping (Fedex is available). Standard shipping and handling charges are based on U.S. Postal Service insured Priority Mail rates to a single address. We will be happy to ship outside of the US, please for international shipping rates. Canadian orders we also offer USPS priority and express mail options. Payment & Security - We accept Paypal for convenient payment options and security. If you prefer not to use Paypal, you can call us to make arrangements or pay us directly by credit card. Until that day comes to pass, you better read this. Photos of dreamcatchers and jewelry are representational only, final design may vary, we will attempt to keep the photos as current as possible. Destarté® maintains this web site as part of its business. Destarté® thus intends it to be used for your personal information, education, and entertainment and welcomes all visitors to explore the site. You may download material displayed on the site for noncommercial, personal use only, provided you also retain all copyright and other proprietary notices contained on the materials and provided you do not attempt to pass them off as your own. You may not, however, distribute, modify, transmit, reuse, repost, or use the content of this web site for public or commercial purposes without first seeking and receiving Destarté®'s written permission. Destarté®, HeartNotes, Gentle Soul, Gaia's Delight, Eagle Warrior, Crystal Weaver, Visionary Violet, Karmic Awakening, Simple Abundance, and Relationship Weave are all trademarks and/or service marks of Destarté®. In addition, the dreamcatchers and jewelry pictured are copyrighted works of Destarté®. Destarté® makes no warranties or representations as to the accuracy of any information on the site and assumes no liability or responsibility for any errors or omissions in the content of the site. Your use of and browsing in the site are at your risk. Neither Destarté®, any of its agencies, nor any other party involved in creating, producing, or delivering the site is liable for any direct, incidental, consequential, indirect, or punitive damages arising out of your access to, or use of, the site. Destarté® also assumes no responsibility, and shall not be liable for, any damages to, or viruses that may infect, your computer equipment or other property on account of your access to, use of, or browsing in the site or your downloading of any materials, data, text, images, video, or audio from the site. Any communication or material you transmit to the site by electronic mail or otherwise, including any data, questions, comments, suggestions or the like is, and will be treated as, nonconfidential and nonproprietary, with the exception of credit card or bank data used to place orders. Anything other than credit card or bank data you transmit or post becomes the property of Destarté®, and may be used for any purpose, including, but not limited to, reproduction, disclosure, transmission, publication, broadcast and posting. Furthermore, Destarté® is free to use any ideas, concepts, know-how, or techniques contained in any communication you send to the site for any purpose whatsoever including, but not limited to, developing, manufacturing and marketing products using such information. Finally, through your usage of this site, Destarté® may gather certain limited information about you and your web site usage. Destarté® is free to use such information for any purpose it deems appropriate, including, but not limited to, creating customized web pages and marketing purposes.